Distributing Cards: Distribute one card to each student, then distribute the extras to strong students in the beginning and to random students as the class becomes more familiar with the deck. 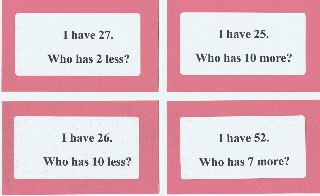 Class Play: As you distribute the cards, encourage students to begin thinking about what the question for their card might be so that they are prepared to answer. When all cards are distributed, select the "0" card or any student to begin. Play continues until the game comes back to the original card. That student answers and then says "stop" to signal the end of the game. Timed Play: Consider using a stopwatch to time the class game. Record the time on the board so that students try each game to beat their current best time. This practice encourages students to stay attentive and prompts students to practice basic facts so that the class time improves. The current record for the multiplication deck is held by a fourth grade class in New Jersey who completed the deck in 59 seconds. If your class beats this record, be sure to send an e-mail with the facts. Calling Out Answers:Discourage this practice by adding 5 seconds onto the class time whenever you hear an answer from someone who does not hold the card. Use the same penalty for students who express vocal displeasure with delays by other students. One student deals out the cards to all players. Players arrange the cards face-up in front of them. 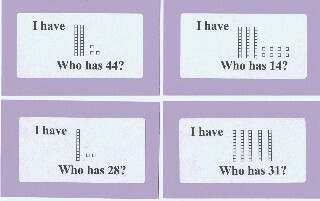 Students will find that arranging the cards in order from least to greatest will help them locate cards quickly. Play begins with the "0" card or any card held by the player to the dealer's left. Play continues as in the class game. Whoever has the card that answers the question reads that answer and then reads the question on that card. Students turn over the cards after reading them. Shuffle the cards and repeat the game. Several decks are attached below for downloading as PDFs. All decks are 30 cards so that there are enough cards for most classes. In fact, some students will probably need to have two cards to use the complete deck. The decks are designed to print onto 2x4 inch labels (10 to a page). These can then be affixed to index cards to create each deck. If labels are not available, simply cut and paste the printout to create card decks. Who Has? Multiplication Deck C practices the 2, 5 and 10 times tables. Who Has? Multiplication Deck D practices the 0, 1 and 2 times tables. Who Has? Doubles deck formatted to print on 2x4 inch labels which can easily be affixed to index cards to create the deck. Who Has? Doubles deck in grid form designed to be printed on card stock, laminated and cut apart to form a smaller deck.